No discussion of classical music would be complete without Schubert. Beethoven was 20 when his future pallbearer Franz Schubert (“SHOE-bert”) was born. Shrewdly observing that every great composer of the Classical period eventually moved to Vienna, Schubert chose to save the plane fare and just be born there. As with Mozart, melodies poured from Schubert like honey from the bottle; after one piece was finished, he simply began another. And his melodies are extremely hummable — even in his symphonies. Franz Schubert (1797–1828), one of the most prolific songwriters in history. Schubert was a decent pianist, but not a virtuoso like Mozart or Beethoven; he didn’t make much money by playing. But his piano came in handy for lots of fun evenings with musical friends, which came to be known as Schubertiads. They’d gather together, play charades, and dance to music that Schubert composed on the spot. Furthermore, his circle of friends became even closer after, broke and jobless, Schubert had to move in with them for long stretches. Vienna was still swooning over Haydn, and Beethoven was making his mark, so Schubert had trouble competing in the symphony department. And a young composer named Gioachino Rossini was packing them in with his great operas (such as The Barber of Seville), so Schubert wasn’t scoring with his operas, either. Theory 1: The two movements stand just fine by themselves. Theory 2: Schubert couldn’t come up with any more movements of that quality to match. In fact, some people have tried to reconstruct a third and fourth movement for the symphony, but to our ears, they don’t sound right with the first two. But as good as Schubert’s symphonies are, Schubert was best at writing small musical pieces — for example, short piano pieces called Impromptu (which means “impromptu”) or Moment Musical (which means “musical moment”). Most of all, however, he was great at composing songs. In all, he wrote more than 600 of them. He called them Lieder (“LEE-der”), because he didn’t speak English. 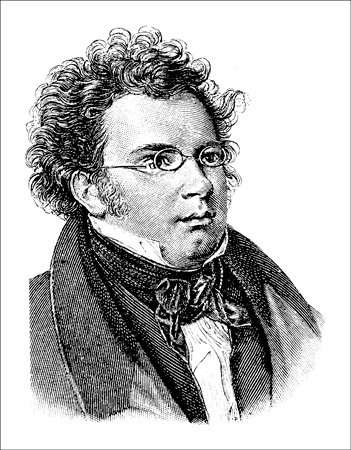 Schubert wrote his Lieder to be sung by one voice, accompanied by piano. In fact, maybe the word accompanied is inappropriate, because in these songs, the piano has an equal role to the voice. When the voice sings of Gretchen at her spinning wheel, the piano plays a spinning figure over and over, suggesting both the turning of the wheel and the agitation of a young girl’s romantic thoughts. When the voice sings of a man and his child riding a galloping horse, the accompaniment graphically depicts the horse’s galloping. When the voice sings of a trout swimming down the river, the piano is the river — and the trout. The more you listen to the songs of Schubert, the more musical detail you can hear in them. Duets are fun because they require a social get-together just to hear how they sound — a fact not lost on Schubert. Often, while composing a piano duet, he’d deliberately write the notes so that the players’ hands crossed each other. Then he’d invite some good-looking local female pianist over to play his new composition with him. One year after being a pallbearer at Beethoven’s funeral, Schubert himself died, of typhoid fever. He died as he lived, very poor and very young — he was 31. In these works, the letter D refers to a catalog number that can help you locate the piece you want in a record store.